ISLAND GARDEN CITY OF SAMAL – The public information office of the island had coordinated with the Philippine National Police (PNP) and Task Force to strengthen the city’s antiterror drive. ISLAND Garden City of Samal – More than 1,000 participants from the different sectors joined the kick-off activities for the 43rd Nutrition month celebration on July 3. The construction of the P16.47-billion Davao-Samal Island bridge will start mid 2019 and end in 2024, bared an official of the Department of Public Works and Highways-XI. 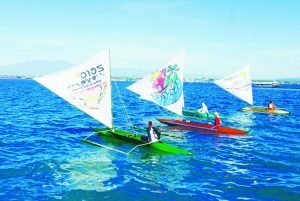 The Visit Davao Fun Sale (VDFS) took to the blue waters of the Davao Gulf and the white sand beaches of Samal last May 7 as the Island Garden City of Samal hosted back-to-back activities. Posted in http://www.sunstar.com.ph, Tuesday, April 25, 2017 By JENNIE P. ARADO DAVAO. Maria Lourdes Lim, Neda-Davao Regional Director, said that seven economic and industrial zones are being eyed to be developed under the Mindanao Strategic Development Framework (MSDF) 2020. (File Photo/Macky Lim) SEVEN industrial and economic zones in Mindanao are being eyed to be developed and established as part of the National Economic and Development Authority (Neda)'s Mindanao Strategic Development Framework (MSDF) 2020.